That was nearly five years ago, and while Las Vegas-based professional poker player Brad Owen has learned a thing or two about playing within his bankroll and dealing with the swings that come with a life as a poker pro, it’s still not always easy. In addition to grinding out on-the-felt gains, Owen is one poker’s top-tier vloggers, constantly documenting his exploits as a real-life $2/$5 reg in Sin City and that comes with its own learning curve. When Owen first started to vlog, in December of 2016, he thought no one would even watch. He had seen the beginnings of fellow grinder Andrew Neeme’s vlog and, while not trying to compete per se, he thought he could offer a different perspective. A perspective he hoped would help him bridge a gap between him and his family. Owen’s parents were not always completely on board with his efforts to be a poker pro, despite him having played the game for so long. Owen recalls starting to play around the age of 14, mostly with his older brother Matt and his friends. That extended into high school and, eventually, when Owen went to college in San Diego, he got his first taste of playing in a casino. He started grinding the $3/$6 limit games and playing $40 tournaments. In 2010, he played the largest tournament he’d ever played to that point – a $100 satellite to the Main Event of the World Series of Poker. He won the seat, and by the conclusion of his WSOP Main Event opening flight, Owen became hooked. Although he busted in the middle of Day 2, he set about learning. Some of it, the hard way. In 2012 he made his first foray into trying to play professionally. He first moved to Las Vegas, then to Los Angeles and it ended up with his crashing with his, then, disapproving parents back in Santa Rosa, CA. Broke and living with his parents he needed a new direction. He decided to study to become a CPA. After passing all the tests though he found getting employed difficult because firms tended to only hire out of colleges. It was the middle of summer and he could only find one master’s program still accepting applications. It just so happened to be UNLV. Owen finished his Masters, got a job at a top-flight accounting firm and was put to work. He was crunching number sometimes 70-80 hours a week. Times are better now, and part of that is in thanks to his vlog. His parents are his #1 fans, watching every episode and his siblings both follow the vlog closely. They aren’t the only ones. His vlog on YouTube has over 32,000 subscribers who tune in to Owen’s adventures. 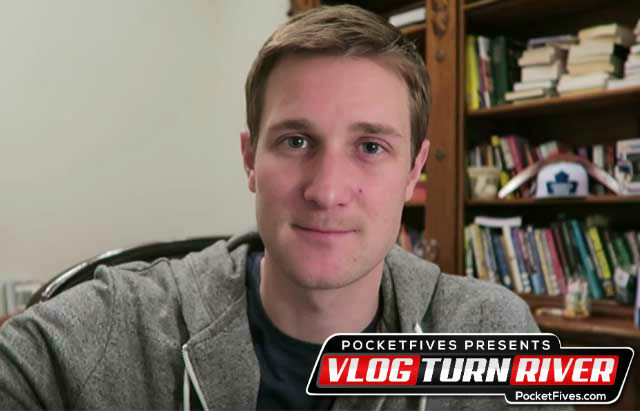 At first, Owen thought of his vlog as a growing experience for his poker career. Hoping there’d be some back and forth on how he played specific hands. Nowadays he finds that while there’s a little of that, there are a lot of beginning poker players who tune in to learn. So, in order to keep things fresh for himself, Owen, who is a fan of comedy, tried to keep his videos light and loaded with humor. In his videos Owens is quick to deliver punchlines in the same cadence that he’s describing a check-raise, giving viewers a taste of his dry and affable sense of humor and personality. It’s that personality, and the poker, that people tune in to see and, of course, Owen’s on-screen foil, his “talking” cat Cosmo. While he’s got his style down, it took him a while to get the process down. He says that when he first started building the videos it would take him 25-30 hours to complete a 15-minute clip. The effort was so laborious that if it weren’t for the encouragement of the Las Vegas poker community he may have stopped. Even now, though he’s better at the process, he’s still spending a ton of time editing on the laptop. “It’s becoming a second job now. The vlogging is starting to pay pretty well and so I’m putting a lot more hours into that than I am playing poker. I played maybe 700-800 hours last year and I probably worked on videos for like 1000 or 1200 hours,” Owen estimates acknowledging that as a pro player one would like to get in about 1500 hours a year. All of Owen’s effort seems to be paying off. He had the ability to play poker and create content while making a living at both, all the while his audience continues to grow. As he looks to the future, Owen sees a wide variety of possibilities including branching out into streaming poker online, seeing more parts of the world and continuing to support Off The Felt, the online poker forums he and his brother Matt created. In the meantime, Owen plans to continue sharing his experience.